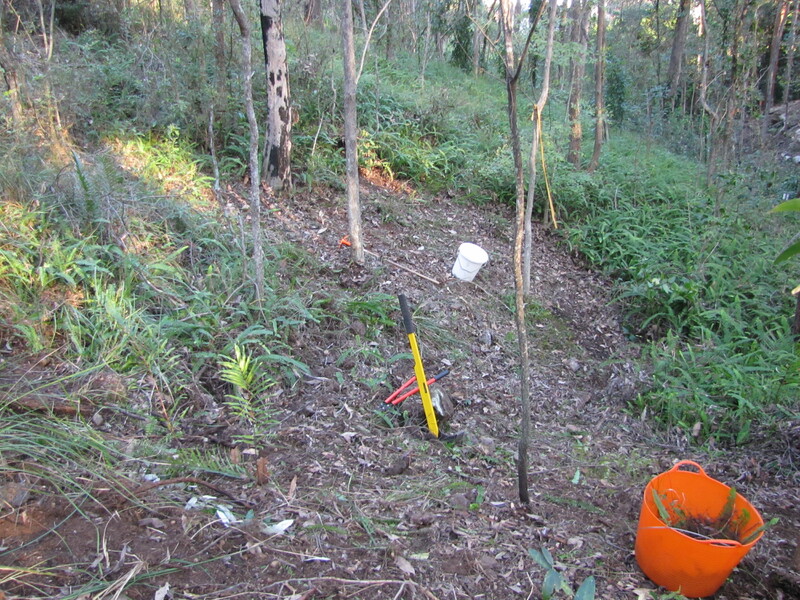 Wednesday Bushcare this week will return to that site to remove any regrowth of Fishbone. When I inspected the site to assess the work required, I was so blown away by the extraordinary natural regeneration occurring, I had to do a quick review. Removing Fishbone fern can be a fiddly frustating job: digging out every nodule then carrying the loaded tubs to the top of the slope. 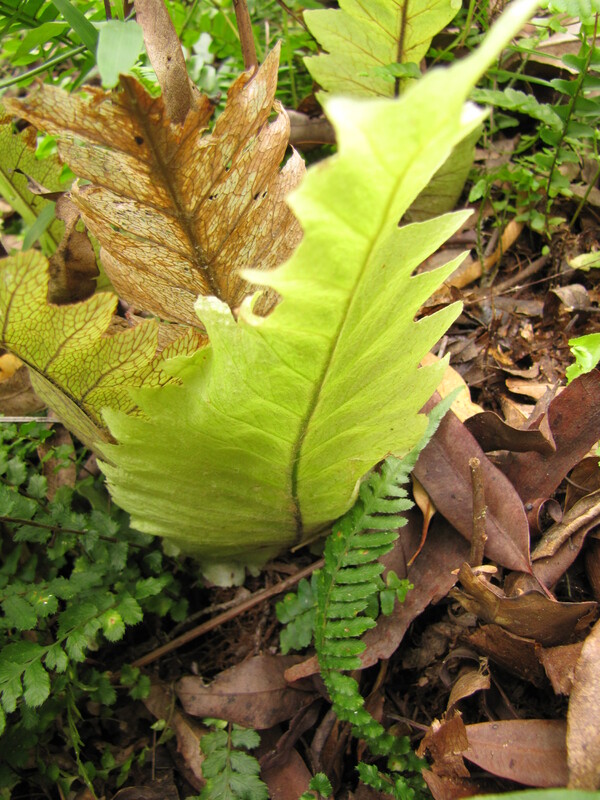 Every part of the fern has to be removed from site to reduce risk of re-infection. In this situation it is great to have a group who can share some fun. “What are these strange nodules we keep digging up?” Cindy is from Busan, South Korea. Tessa,Virginia, Luke and Mike are part of the FWR team. The team also removed Easter Cassia, Chinese Elm and Ochna. Virgina proved quite adept with the new Treepopper provided by our sponsor BCC Habitat Brisbane. 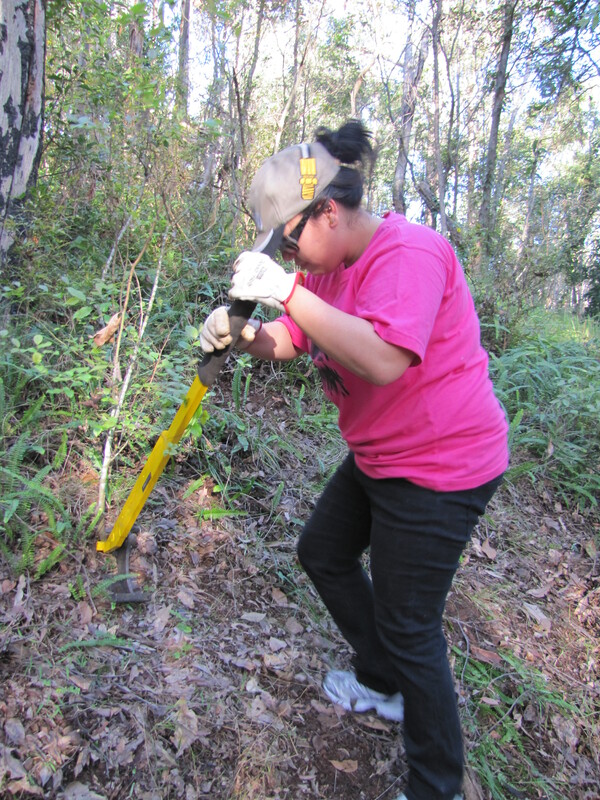 Seeing results is a key factor in motivation for a volunteer bushcare workforce. The Treepopper delived results on the day, making easy work of these, normally hard to remove, woody weeds. Nine is the biggest team we have had for Wednesday Bushcare and at the end of the afternoon the results showed. The thick green border of Fishbone shows how much has been removed to create this clear ground. 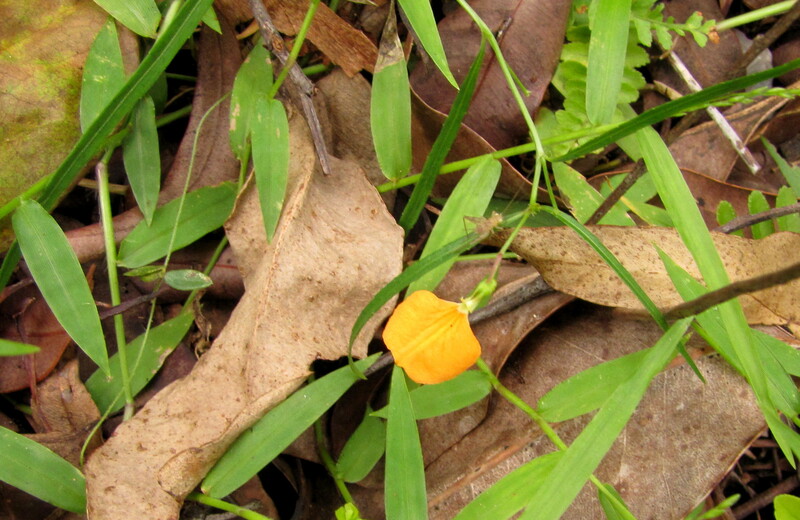 in a thick growth of Ottochloa gracillima Graceful Grass which is supressing weed growth as well as providing caterpillar food for Brown and Orange-streaked Ringlet butterflies. There has been some regrowth of Fishbone fern and some infection with other weeds however the most striking change is the extraordinary natural regeneration of the native grasses, herbs and ferns. Herbs like the unusual Spade Flower Hybanthus stellarioides are now appearing in this area where they were not found before. 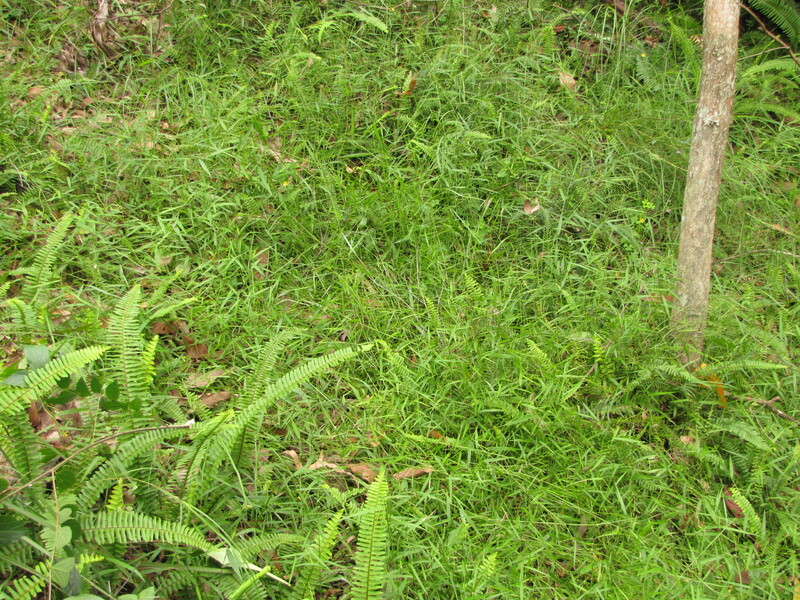 The Basket Fern has also benefited from the weed removal with fresh new growth appearing and outgrowing the invasive Fishbone. Visiting this part of the site and seeing the native plants restoring the habitat is a real boost. 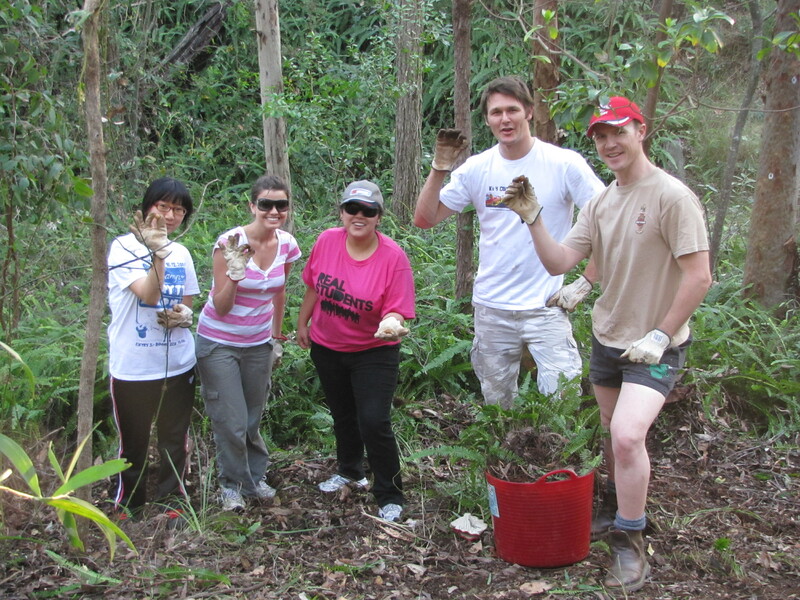 So I hope you can join us this week for Wednesday Bushcare in Fox Gully.